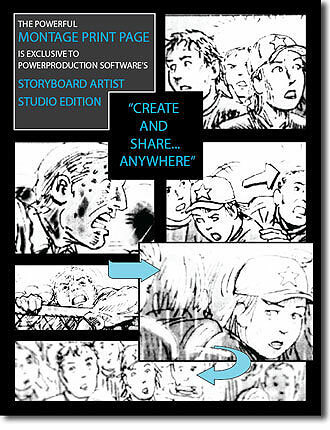 Artist Studio Edition adds enhanced features to further assist professionals and animation workgroups beyond StoryBoard Artist. Paint Canvas, Onion Skinning, Pen Tablet support, Advance Timeline features, freeform layout Montage Printing and Automatic Effects. 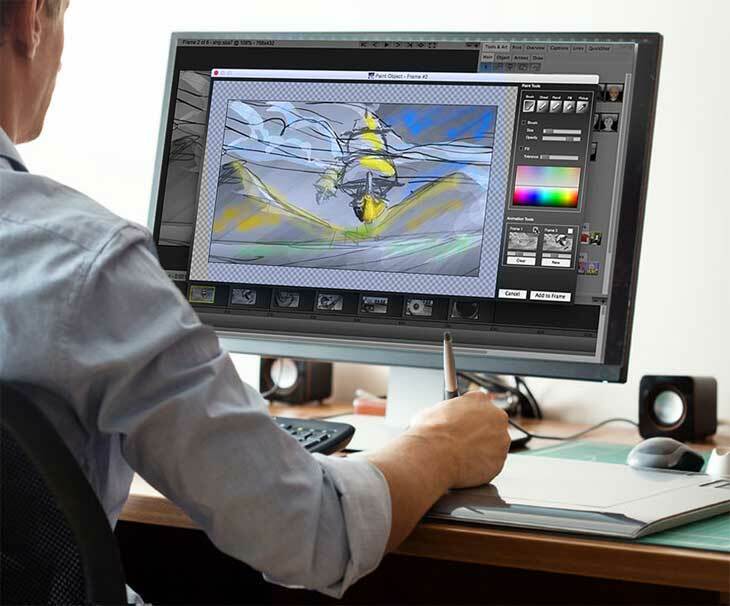 Paint canvas includes paint tools to ease animation and illustration. Onion-skin Next and Previous frames to precisely control your animation between frames. Use your Pen Tablet with pressure-sensitive and eraser support. 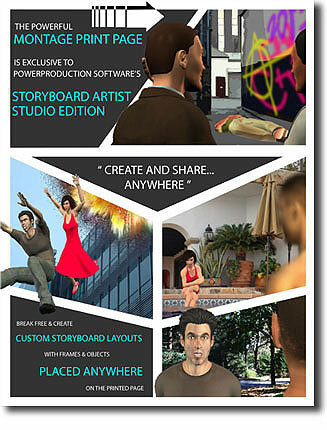 As in Artist, this Artist Studio Edition provides 2D graphics and 3D models working together in one app for creative flexibility and speed to assist in producing dynamic scenes and sequences. Save unlimited edits of the same project to toggle between versions. Mix, level and lap sounds in the 16 sound tracks available for every project. [Cut sound, reposition, and edit volume. Create real-time transitions.] Lift sequences, add slugs, save, import and export partial projects for integrated workflow between artists. 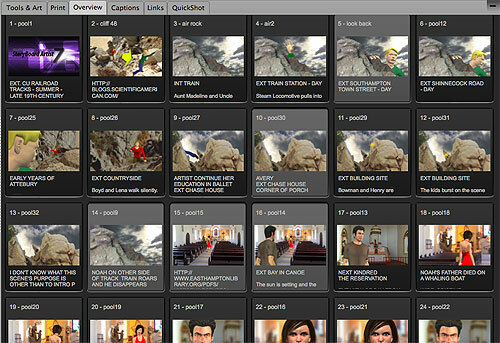 Precise Timeline control for creating animatics/storyreels. Perfect for feature animations and large studio previsualization projects. -Lock and adjust segments of sequences. -Mix, level and lap sounds in the 16 sound tracks available on every project. -Lift sequences, add slugs, save, import and export partial projects for integrated workflow between artists. with Artist Studio Edition's Montage Printing. This feature gives you more than a continuous linear story board layout template. Artist Studio Edition adds the custom Montage Page printing feature. Each element can be controlled independently. Move any frame, any image, anywhere on the page. Overlap elements inside/outside frames. Include arrows between frames to show camera movement and frame transition. Unlimited formats with unlimited montage and continuity printed pages. Use Automatic Effects to adapt any built-in or imported graphic, allowing you to edit its brightness, contrast, color, opacity, perspective, and more! Effects open possibilities for specialized elements, plus Automatic effects for directors (who don't draw) such as Depth of Field, Shadows, Auto Reverse Shot, Screens and Filters, including Black & White and Sepia. Demonstrate complex shots or FX as they play out over time. Two frames will do it: Frame the beginning set up and the end set up and Artist Studio Edition does the rest. Save Projects to all formats. 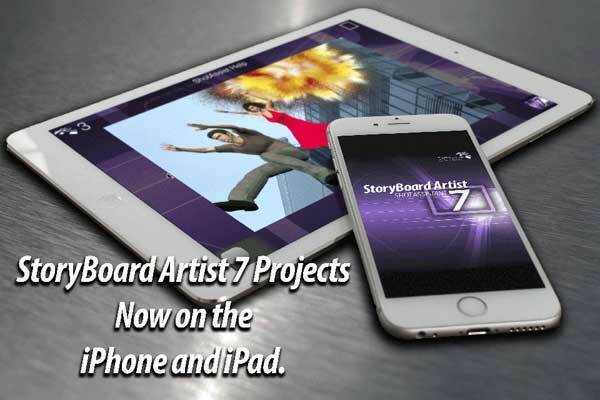 Projects from Artist Studio can be exported directly to your editor, popular video and image formats, HTML, and mobile. Multi-window interface: Jump from Page Layout to Timeline to Overview to 3D Window to Paint Canvas to Print Layout. 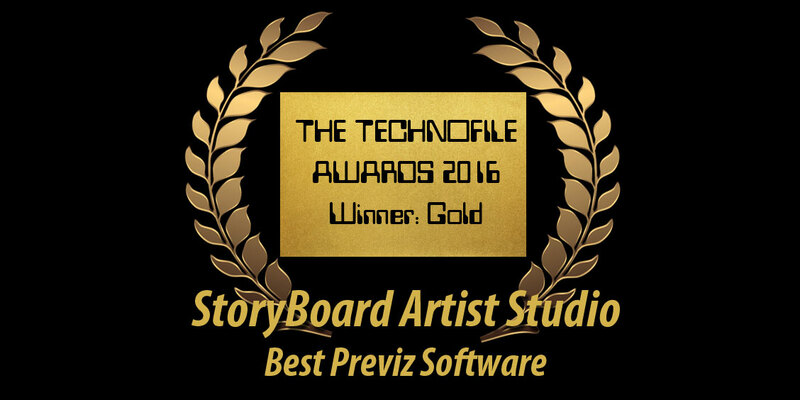 Preview and present your story projects in motion (moving boards aka: animatics/story reel) before going into production, giving you an edge with your vision, your sequence timing and your budget. 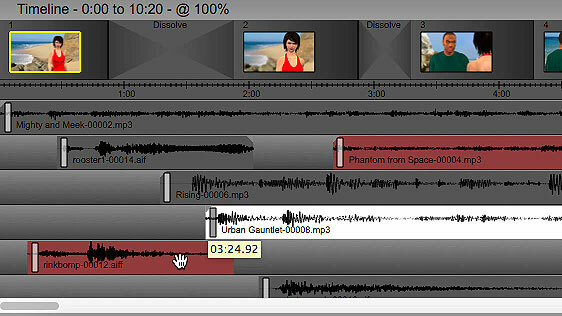 The powerful Pan and Zoom tool (a/k/a Ken Burns Effect) makes motion graphics and animation in the frame a snap. Move objects independently making your shotsS come alive. Artist Studio Edition Importing and Exporting capabilities makes working with other programs easy. Now with 3D, video and image imports. Massive amount of artwork included, complete with angles & character expressions. Choose from hi-res, colorable and 3D characters as well as backgrounds and props. Advanced features allow for Artist Studio to assist prototyping for any type of media development: film, video, broadcast television and web development. StoryBoard Artist's video tutorials supply tips and tricks to get you started quickly to make professional storyboards and presentations. PowerProduction FREE Tech Support is there when you need it. Upgrades and updates regularly available.